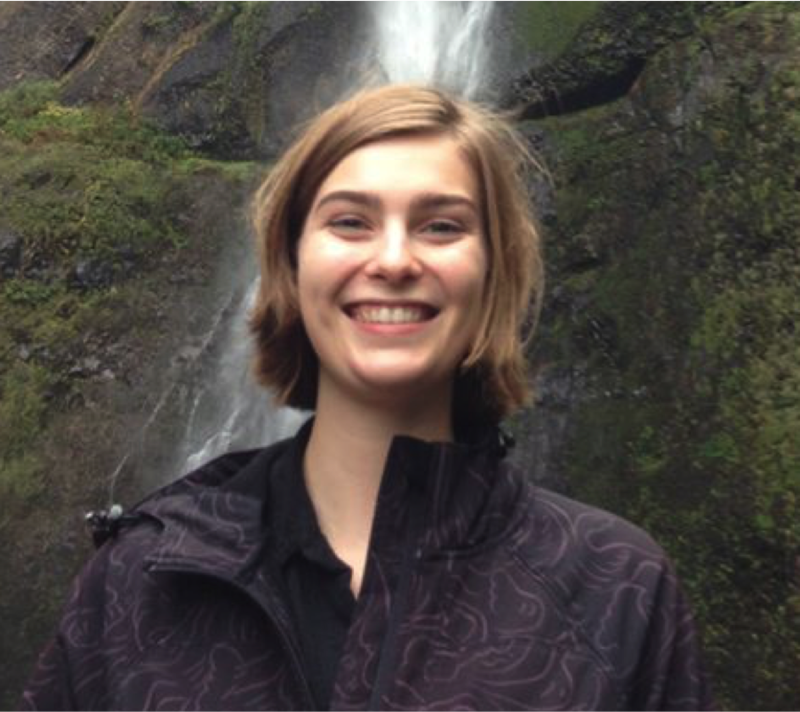 Programmer dedicated to making good code and drinking good beer. This series is meant to help a beginner get started with application-hosting on IOS-XR. In this tutorial we intend to utilize almost all the techniques learned in the above series to inject third-party BGP routes into Cisco’s RIB table. This tutorial focuses on hosting the Solenoid application on IOS-XR, but following is a brief description of how Solenoid works. 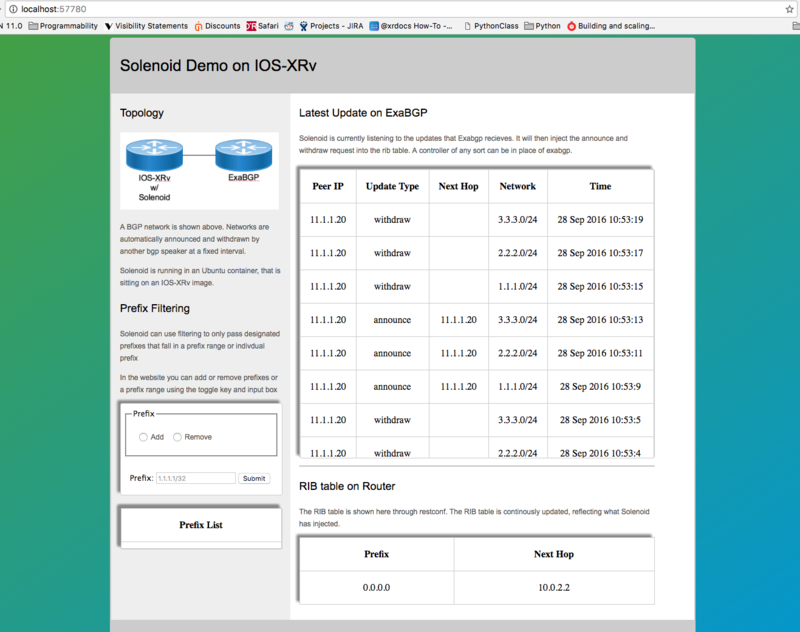 For the demos Solenoid uses exaBGP as a third-party BGP software. exaBGP will be running on an Ubuntu vagrant box as well as in a third-party container on the IOS-XR (see Understand the Topology for more information). The two boxes form a BGP neighbor relationship. When exaBGP in the IOS-XR container hears a neighborhood update (either an announcement of a new route or a withdrawal of an old route), Solenoid works as the glue between exaBGP and the Cisco RIB table. Solenoid hears the exaBGP update, and pulls out the relevant data from the exaBGP udate and models it using the Cisco YANG model for static routes. Then it uses gRPC to send the data to the RIB table. Make sure you have Vagrant and Virtualbox installed on your system. The system must have 4.5GB of space available. The topology includes an IOS-XRv router (3.5G RAM) and an Ubuntu instance (501MB RAM). It would be beneficial for the user to go through the XR Toolbox Series. But it is not a hard requirement. Following the steps in this tutorial should work out just fine for this demo. devbox: The Ubuntu Vagrant box on the right. This is running exaBGP and is peered with the xrv router to its left. exaBGP is sending out 3 BGP neighbor announcements and withdrawals about every 2 seconds. xrv: The router on the left. This router is running a gRPC server, and is not running any version of Cisco’s BGP. It has an Ubuntu LXC as it’s third-party container instead, which is running exaBGP and the Solenoid application. solenoid container: The Ubuntu LXC that is running on the xrv. exaBGP is peered with the devbox and hears all of its neighbor’s announcements and withdrawals. Upon receiving a neighborhood update, exaBGP runs Solenoid, which uses a gRPC client and YANG models to send the new route (or withdrawn route) to the RIB table in the IOS-XR. The entire environment can be replicated on any environment running vagrant, provided there is at least 4.5GB of space available. remote: Counting objects: 1539, done. remote: Compressing objects: 100% (623/623), done. Receiving objects: 100% (1539/1539), 713.76 KiB | 317.00 KiB/s, done. Resolving deltas: 100% (884/884), done. Before we spin up the routers, we can create the container tarball for the Solenoid code. The way the launch scripts are setup for xrv, you can launch the vagrant boxes without creating a new Solenoid tarball (since one with the latest release will be downloaded for you automatically). But if you interested in the absolute latest code, or are interested in the process for your own education, follow the steps below to create your own Solenoid tarball. If you are not interested, skip to Launch router topology. exaBGP is already installed and running on your devbox. If you want to see it running, you can jump into the exabgp screen. Start the container. You will be dropped into the console once boot is complete. These dependencies make it possible for us to install the important components of our applications. Now, download Solenoid from github. Using the Solenoid directory, we can install most of the remaining dependencies with the setup.py installation script. Let’s install the dependencies in a virtualenv. First, navigate into the Solenoid directory and activate the virtualenv. The (venv) indicates that you have entered your virtualenv. Now you can install the dependencies, and they will only be available in your virtualenv. This means you will have to activate your virtualenv in order to run Solenoid. Perfect! Now all of our dependencies have been installed. This line runs a custom script. The /usr/bin/env python is the path to your python instance. Specifically, it is the path to the first python instance in your PATH, which is important because we are using a virtualenv where the python path might be different than the normal /usr/bin/python. /home/ubuntu/Solenoid/solenoid/edit_rib.py is the path to the file that launches Solenoid. The second half of the line, -f '/home/ubuntu/Solenoid/filter.txt' is an optional file argument pointing to the file used for filtering . For more information about the router.ini file, please consult Solenoid’s Wiki and review exaBGP’s documentation. P.S. If you check the Vagrantfile, we intend to expose port 58822 to the user’s laptop directly, on IOS-XRv. You’re back on the devbox. See what we did there? We packaged up the container tarball as solenoid.tgz under /vagrant directory. Why is this important? Now you have your solenoid tarball! This will be used to launch the container on your IOS-XRv. If you did not create this tarball, the Vagrantfile is smart enough to grab the container from the internet. Launching the router topology is incredibly simple. Just do a vagrant up in the Solenoid/vagrant/ directory. ==> xrv:     Welcome to the IOS XRv (64-bit) VirtualBox. Great! Time to start playing with Solenoid. Here you will see the routes being added and withdrawn from the IOS-XRv’s RIB table. These routes are the routes that are being automatically sent and withdrawn from the exaBGP instance running in your devbox. 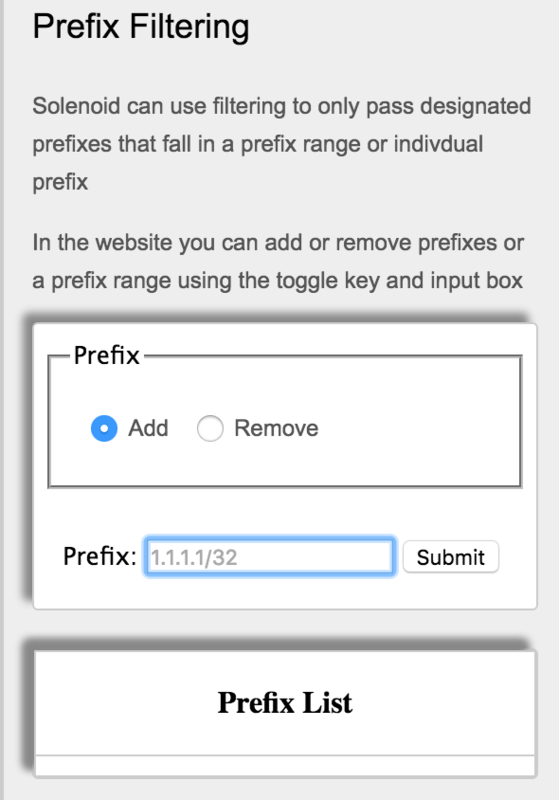 Currently there is no filtering enabled, but feel free to add prefixes or prefix ranges to the filtering file. This file acts as a whitelist, so by adding a prefix or prefix range, all other prefixes will be dropped. For example, add the prefix range 1.1.1.0/24-2.2.2.0/24 to the filtering. Now watch as the 3.3.3.0/24 network never gets added to the RIB table, because it has been filtered out. To view the application running on the box, reference the instructions below on how to navigate the vagrant environment. Let’s see what Solenoid looks like on the box. First we’ll check our RIB table on the xrv. In order to do this, we need to SSH into the xrv. First, find out the port that has been forwarded for port 22. Then ssh into that port, and you will find yourself in the CLI. From there, view your RIB table. We can see here there are currently no static routes except for 0.0.0.0/0. You may see some routes other than this, as Solenoid is running and adding routes constantly to the RIB. Now leave this screen up, open a new tab in your terminal and jump into the Solenoid container. Remember when we changed the ssh port of the container? Now we will use that port to SSH directly from our CLI into the Solenoid container. The authenticity of host '[localhost]:58822 ([127.0.0.1]:58822)' can't be established. ECDSA key fingerprint is SHA256:Swie3V2VIYDNCACaRLbSjQa7417yIM6hpbeimNwZr1o. Warning: Permanently added '[localhost]:58822' (ECDSA) to the list of known hosts. We are now on the Solenoid container that is running on the xrv. Solenoid is currently running in a screen named exaBGP. Resume the screen to see Solenoid running. These messages show the output of Solenoid running. All of the OKs show us that it is running properly. If you hop back to your tab running the CLI and run show ip route a few times, you will see the RIB table changing with the messages that Solenoid is sending. From this example you can see that we first added 1.1.1.0/24, then in a moment 2.2.2.0/24 was added. 3.3.3.0/24 will never be added, since we added the filtering on the GUI. Hopfully this tutorial was helpful! If you have issues or questions running Solenoid, please visit Solenoid’s Issues page and submit your question.